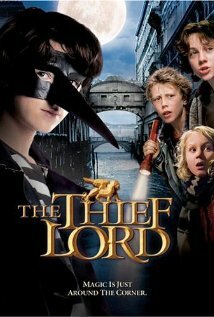 An excellent movie adaption of an even better book is The Thief Lord, a family film whose story takes place in the magical city of Venice. Two main characters, Prosper and Bo, are orphaned brothers who run away to Venice when their aunt and uncle choose to only adopt 6 year old Bo. In Venice, the boys befriend a group of other young transients and their leader, Scipio, also known as Thief Lord. Prosper comes to admire and respect Scipio, and they, along with the other children, live in an old abandoned theater and steal in order to survive. The aunt and uncle hire a detective named Victor to find the brothers, and they attempt to outwit him. This thrilling mystery by Cornelia Funke is available on DVD and can be enjoyed by all, and I especially recommend it to families heading to Venice.